After having been put up for pre-order in other EU countries (such as Germany and France) last month, the Nokia Lumia 930 is now ready to be grabbed in Italy. The official Microsoft online store is handling the pre-orders in this case, and the price you'll need to pay for a Lumia 930 is €599, VAT included. That's around €50 more than what the best deals in Germany are. 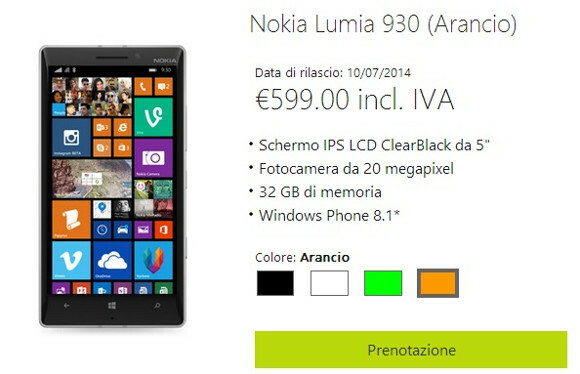 In Italy, the Lumia 930 is expected to finally become available on July 10, which is in just under two weeks from today. You can choose between black, white, green, or orange when you pre-order. The Nokia Lumia 930 was announced at the beginning of April as the international version of the Verizon-exclusive Lumia Icon. It's currently the Finnish company's premier Windows Phone 8.1 offering, though its rollout seems to be taking quite a while. how many mega pixels does it have? How many internal GB does it have?